Thomas Chaloner has been called back to London from Tangier, by his employer the Earl of Clarendon because his Lordship is in the process of having a opulent new house built and expensive building materials have been disappearing almost every night from the site. Chaloner is an intelligencer, a former spy, who is employed on the earl's staff in the sinecure position of an usher, but is used for his gifts in advising his master in various other capacities. 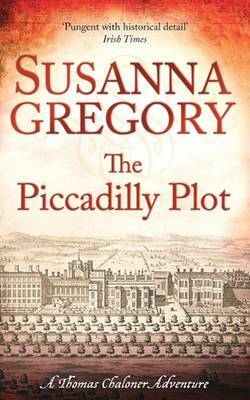 This quite excellent book, the seventh in the series, is set in leafy Piccadilly, London, during October of the year 1664. Chaloner was originally a 'Roundhead', employed by Cromwell's armies but Cromwell is dead and Charles II is on the throne so he is now working for a royalist earl and his illustrious past has been forgotten. Chaloner's boss expects him to keep a close eye on the building site of his new home and advise him what is happening to all the missing bricks and planks of wood, but he also sends him off to check into other problems such as that of his son. Hyde, the son, is worried that the Portuguese Queen Katherine who married Charles in 1662 is receiving letters threatening blackmail for reasons of treason. There is a letter also threatening the death of the architect of Lord Clarendon's new house which appears to have apparently been commissioned by the Queen. Chaloner is also involved in trying to break up a pointless duel, but is unsuccessful and both assailants die and the repercussions are felt throughout the story. There are a large group of merchants (The Piccadilly Company) who have interests in shipping glassware to Africa and receiving in return cargoes of gravel back but is it really that? There is also another group called The Adventurers, with similar export orientated objectives but with a different location and goods). Slavery is a topic on people's lips at that time and of course it was customary to obtain them in Africa and take them to America if they lasted long enough. Chaloner has to check into all of these assorted problems. There are a large number of characters in the cast of this very fascinating story and Chaloner needs to tour the cafes, alehouses and brothels to speak with them all and they are gradually introduced to the story. He is pleased to be back in London of course on a personal note, as he only got married about a month before he left and he hasn't had much time with Hannah his wife, since he left for Tangier and she has obtained a new house and four new servants. She is working as lady-in-waiting to the Queen and is very busy so Chaloner and Hannah hardly see much of each other. Keeping the servants gainfully occupied seems to be a job in itself. Although this book is a work of fiction almost all of the characters and quite a lot of the plot is based on reality. The author has written 24 books and apart from the Thomas Chaloner series there are also the seventeen historical thriller stories about the 12th century, Brother Cadfael style monk, known as Matthew Bartholomew, physician and Fellow of Michaelhouse College, Cambridge. Previously, I had the pleasure of reading TO KILL OR CURE. All of her books are extremely well written. The story I'm reviewing was very entertaining, the historical research is first rate and there are a lot of side plots and some very unusual characters with odd personal habits to take one's attention from the main plot. I thought it was quite excellent and enjoyed it tremendously and just could not put it down and did not want it to end.